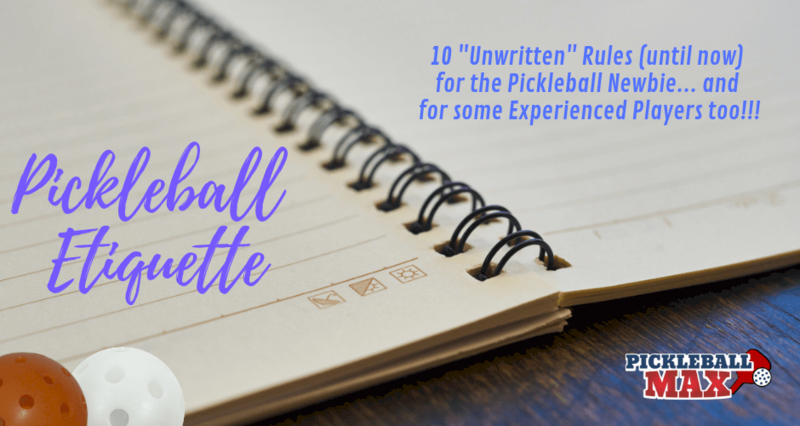 You are here: Home / Pickleball Fun / Pickleball Etiquette — Unwritten Rules (until now) for the Pickleball Newbie… and for some Experienced Players too!!! 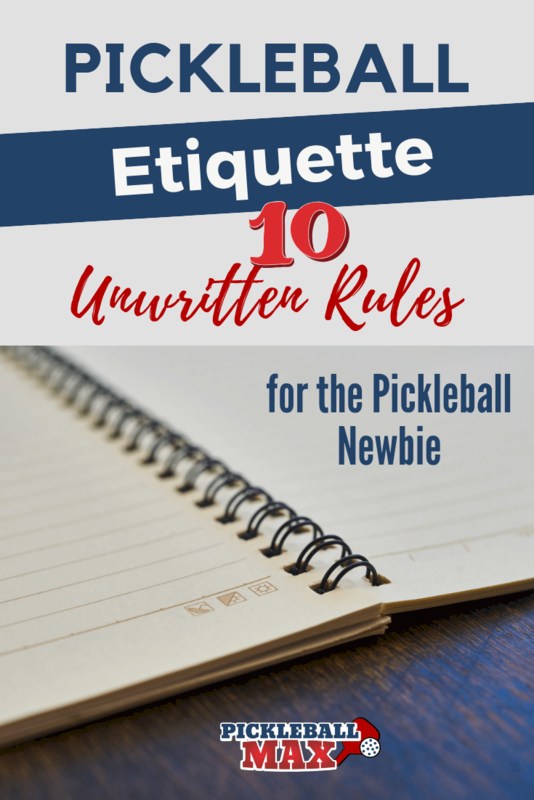 Pickleball Etiquette — Unwritten Rules (until now) for the Pickleball Newbie… and for some Experienced Players too!!! If you’re a pickleball newbie, you can download the USAPA & IFP Official Tournament Rulebook to find the “official” rules about how to play the game of pickleball. Etiquette “rules,” on the other hand, are generally unwritten – yet equally as important. When retrieving a ball from an adjacent court, make eye contact with someone from that court and then directly toss or hit them the ball. Don’t just hit the ball back into their court without looking. That’s very annoying! Don’t play keep away from the best player on the other team during rec play just so you can win – they want to play too! Don’t cross the court behind a match until play has stopped. It’s not only rude, but it can be very dangerous as well. Don’t chest-bump or be excessive in the celebration when your opponent makes an error. If, on the other hand, you or your partner made a great play… 🙂 Same goes for the “spectators.” Please don’t clap or cheer when the opposing player misses an easy shot. If you are obviously the weakest player on the court, thank the other players for playing with you after the game. However, don’t take advantage of their graciousness by staying on the court for an indefinite period of time. More than a game or two will undoubtedly wear out your welcome. If you are asked to play with a group that is obviously of a lower skill level than you, graciously accept and play a game or two with them. They will likely appreciate your graciousness and understand that you want to get back to similarly-skilled players after the game. If you are obviously the strongest person in your foursome, tone down the competitiveness and hit your opponents balls that they can return. Work on a new skill – perhaps it’s a great time for work on that third shot drop shot. If you and your partner can’t determine if the ball was in or out – or if you disagree with your partner on a line call – the benefit of the doubt goes to your opponent. Wait! That’s actually an “official” rule! In rec play, don’t exploit someone’s physical limitations just so you can “win.” Not cool! I would love to hear from you in the comments below. What are some other etiquette considerations you may encounter during rec play? See you on the courts! I agree with all but the first one if it’s Rec play and we are playing with Club balls. It’s sometimes just quicker to toss your ball to them and retrieve the ball on your court. Certainly if it’s a league or tournament then I agree. All other etiquette rules are great imho. Hi Charlie, I listed this one first because it drives me the craziest!!! Ha!!! We’ll just have to agree to disagree on #1. 😉 Thanks for stopping by. Hi! I am confused about rule number 1. Why is it improper to throw them my ball as opposed to chasing their ball and giving it back? Hi Barb, I expound on this here (although, admittedly, the post was written a bit tongue-in-cheek): https://www.pickleballmax.com/2017/10/pickleball-pet-peeve-ball-adjacent-court/. When you finish a game, make sure your foursome leaves and allow a waiting foursome to play. Hi Linda, Yup, when courts are full one should always be respectful of those waiting. Thanks for commenting. Hi Mike, Many have mentioned this exact thing. Thanks for expressing it here in the comments. I am a good player but my hip hurts when I pick up a ball. Therefore I often hit it along the floor to save myself some extra pain. But I have become very good at aiming! I see no problem with this as long as it is hit to the player and they have no problem with picking up the ball. Thanks! Hi Mary, We will certainly make an exception for you! ;-). Glad you’re still able to play this great game!!! I agree. After the point, hit the ball to your opponent so it is easy for them to catch. I play sometimes with an 80+ player who hits great shots but he struggles to bend over and pick up the ball to serve. I try to get the ball and give it to him so he does not need to bend over. Clarify: when returning a ball to another court, pick up the ball and hit it back rather than kicking with your foot or scooting with your paddle. Adjacently, it happens from time to time. The ball is dead when another rolls in from an adjacent court. When this occurs at nearly the same time, and perhaps simultaneously, it’s okay to exchange balls..provided the balls are known to be identical and that players doing the retrieval make eye contact and smile with anothers’ good fortune. If you don’t have a foursome ready to go, don’t jump on the center court claiming it for the next game while waiting for three more to sign up. Course the other two courts have baskets in the way and poorer lighting. Really frosts my a$$ when they do this. John. Hi John, I can definitely see how that could annoy one. Thanks for sharing. For indoor play we always stack paddle on a table and just the next four play. If you want to play with a certain group just wait until all four are off court and then add your stack. Works great for us. We have almost 500 members in the Quad City Pickleball Club playing in different indoor facilities. All were busy last Wednesday when the temp was -33. Great feedback for those busy, indoor venues. Gotta love the passion of you all!!! Please add something about poaching! Too often a male player will jump in front of me to poach a ball when it is coming straight to me. Remember this player is your PARTNER and you need to trust them! Plus they want to play also! Sometimes poaching is warranted when you see your partner is not in a position to play the ball, but you shouldn’t reach in front of your partner just because you think you can get the ball! Thanks! I’m sure the poachers are taking note of your concern. They know who they are!!! Sorry, I disagree with #5. Excessive isn’t warranted, but wherever you go or play, people will cheer a winning play. It doesn’t mean disrespect for the other player! It just means you are cheering for your team or for a play well done! Same as in most sports. Why should pickleball be any different? Yup, I think we’re on the same page. Cheer a good play — however, not an easy, unforced error by the opponent. In our PB Club our rule is the person serving raises their paddle and will receive the ball. Also nobody ever goes on a court when play is in progress ……. We yell Ball…… and the players should STOP. If the Ball is by their feet you yell Ball Ball Ball until they STOP…..
Hi Mike, Great rules at your pickleball club! I love that the server raises their paddle to receive the ball. As in life, unsolicited advice on the pickleball court is off-putting, no matter how well-intentioned. Unless you are playing with a newbie or are in the throws of tournament competition, resist the urge to be your partner’s coach. Most tennis players and golfers seem to know this instinctively. Thank you for sharing these unwritten rules. These should be posted wherever people play pickleball for all to read. I just love this game and I try my best to follow these all the time! Thanks, Edwina, for dropping by. Sounds like you’re a pleasure to play with and against! See you on the courts! I agree with most of your 10 rules, but… we are out there to win. Rec play is all I and my friends do. However, at The Villages, FL, we have courts scheduled for Beginners, Intermediate and Advanced. Above that is rated players who have their own groups and tournaments. We casual players may “switch” the ball, unless they ask for “their ball” back. We are transitioning to a new ball here. You seem a little too up tight for Rec play. These rules are great and I support their use, but there also needs to be a set protocol for the warm up. In tennis there is a set agreed method (drives, then volleys, lobs and service practice), but in the short time that I have played, in pickleball it’s a quick matter of “shall we start then??!! !” It would be good to get an agreed protocol, which everybody uses. Hi Alan, Great comment. You are correct that the warm up period is generally neglected in pickleball. I know I need the warm up time to get the rust off!!! 😉 See you on the courts. I want to have everyone comfortable with the warm up time. If you need a specific warm up practice then ask for it. I will be glad to comply and I expect others to do the same. Don’t play back because you aren’t comfortable up by the kitchen line! You’ll never get comfortable if you don’t try and you will frustrate your partner who wants to play up and has no idea where you are in the back court. Good tip, particularly for the pickleball newbie. Do keep in mind, however, that they may be brand new to the sport and don’t yet have a grasp of all the strategies. Thanks, Kathy. You’ve got the right attitude!!! When the other team makes a good play, tap [clap] your hand on your paddle to recognize and congratulate the other player. Hi Gary, That’s a great idea!!! People love it when good play is recognized. Great article and great comments. I have one additional note on Rule #1: Even if two balls look identical (and were when new), one might have been “conditioned” by more playing time. I’ve had this happen, where my foursome had to insist that we get “our” club ball back, even though the other club ball looked identical. Please don’t switch balls. Another situation I’ve seen numerous times, is when there is a line dispute and the player who was chasing after a ball to hit it insists that their call is correct because they “were the closest”. Studies have now proven that a person chasing a ball actually makes the worst line calls. In doubles, let your more stationary partner make the call. Similarly, if a ball lands where it is overlapping the line, a player looking straight down at that ball cannot tell whether there is a gap between the line and where the ball contacts the floor. Their partner usually can, from across the court. My group now has a joking but serious call, “I saw a gap”, meaning the ball was out (Rule 6.C). Respect The Gap! I agree, everyone started out as a beginner and I see no reason to grovel to more experienced players. I feel it’s demeaning and disrespectful. Hi Sandy, There’s certainly something in this blog post for both beginners — as well as higher-level, experienced players. Everyone has to put themselves in the other person’s shoes and treat each other with respect. I fully agree with #5 and I would like to add; NEVER thank your opponent for making a mistake or a poor shot return. He or she did not intend to slip up. It is very rude to applaud their unintentional play. Maybe an odd, seldom happening but, a ball is hit onto the horizontal bar that stretches the net and goes into the opponents court and is not returned. What is the call? I remember reading in the rules that it is good, but my wife disagrees with me (how unusual). Hi Chet, I hate to say it, but in this instance, the wife is correct. 😉 The following blog post addresses this scenario (and others) on a portable net: https://www.pickleballmax.com/2017/10/portable-pickleball-net-systems-rules-to-know/. What about announcing the score before you serve? Is this a rule or etiquette? 4.A.1. The entire score must be called before the server begins his or her service motion. This is a pet peeve and a rule too. Complete the score before starting the service motion. And please say it so the opponents can hear it. If there is a mistake, call it out at once or directly after the rally. Rules vs etiquette: As a newby, while playing a rec. game with no ref. I hit a ball down the line and saw it as out,I then call it so. My playing partner said as it was on the other side of the court I had no right to make a call and thought we should have claimed the point as we were serving. We disagreed and after the game she took it up with the local coach and rules person, he said that she was right as the rules state that you cannot call a ball on your opponents side of the court! Where does this leave the etiquette of a game. 6.D.6. Requesting Opponents’ Help. A player may ask the opponent’s opinion if the opponent was in a better position to make a line call on the player’s side of the court. The vision of a player looking down the line is more likely to be accurate than one looking across the line. An opponent’s opinion, if requested, must be accepted.